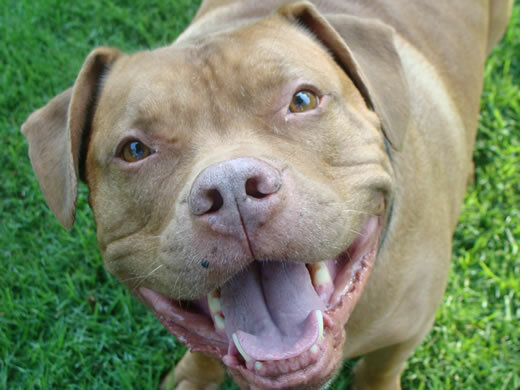 A seven-year-old pit bull named Petey was the first dog enrolled in the initial pilot trial at UGA in 2011. He is doing well today. The American Kennel Club Canine Health Foundation, Inc., has awarded the University of Georgia (UGA) College of Veterinary Medicine and Emory University a $119,000 grant over three years to test a newly developed experimental drug to treat dogs with naturally-occurring brain tumors, following partial surgical removal of those tumors. The goal of the research is to help translate new brain cancer therapies to humans by assessing results in dogs with similar diseases. According to the researchers, the tumors in dogs, known as spontaneous gliomas, are very similar to human malignant brain tumors both by imaging and biology, and both tend to grow back rapidly. The poor prognosis for dogs with gliomas is similar to human patients. The researchers are hoping the novel treatment being tested will slow down tumor growth. A seven-year-old pit bull named Petey was the first dog enrolled in the initial pilot trial at UGA in 2011. Following discovery of a brain tumor after a seizure, Petey underwent surgery in September 2011 to remove a portion of the tumor. Simon Platt, BVM&S, a professor of veterinary neurology at UGA, performed the surgery and diagnosed Petey with a glioma. After surgery and for three days, an investigational drug was directly infused into the glioma tumor area via catheters, targeting any residual tumor cells. Petey underwent blood testing and complete neurologic testing confirming no toxicity of the therapeutic agent. Six weeks after surgery, Petey had a follow-up MRI that revealed the therapeutic agent still within the remaining brain tumor. Petey had another MRI five months after surgery showing a marked reduction in tumor size. Petey remains alive and well now 15 months after surgery and is seizure-free. "We are very pleased with Petey’s progress following surgery and medication delivery," says Platt. "Seizure activity experienced prior to surgery has not returned and Petey’s owner reports he is doing well." The experimental agent was developed in the Winship Cancer Institute Brain Tumor Nanotechnology Laboratory of Costas Hadjipanayis, MD, PhD, assistant professor of neurosurgery, Emory University School of Medicine and chief of neurosurgery at Emory University Hospital Midtown. The agent is the FDA-approved monoclonal antibody known as cetuximab, attached to an iron-oxide magnetic nanoparticle (IONP). The IONP allows for direct visualization of the agent in the brain by MRI due to the magnetic properties of the nanoparticle. "We have translated this agent to canines with spontaneous gliomas to study its safety and feasibility," says Hadjipanayis. "By targeting the same receptor in canine gliomas that is over-expressed in human brain cancer, known as glioblastoma (GBM), we hope to have a clearer picture of the safety and therapeutic efficacy of the agent." Initial pilot funding for this research came from the UGA College of Veterinary Medicine, the Winship Cancer Institute and Dana Foundation grant money received by Hadjipanayis, as well as the Boo Radley Foundation. Dog-owner Ken Johnson formed the not-for-profit foundation after his dog, Boo Radley, a Black English Lab, passed away from a malignant brain tumor. Boo participated in three canine clinical trials in three different states before he died. "This foundation was started to support research in medicine that has a direct correlation between dogs and humans," says Johnson. "Our mission is to support the efforts to heal man and man’s best friend in the best way we can. The Boo Radley Foundation looks forward to continued support of the extraordinary efforts of Emory University and the University of Georgia." The grant money from the American Kennel Club Canine Health Foundation will fund a clinical trial at UGA in approximately 15 canines with spontaneously-occurring brain gliomas. The canine trial may lead to human testing if further safety and tumor control can be confirmed.